Pride is an infectious and dangerous attitude affecting so many people in this day and age. Where does pride come from? How does this kind of attitude affect you and your walk with God? How does it affect others around you every day? Let us search the scriptures together for knowledge, wisdom and truth that comes only from God, Himself. “For from within, out of the heart of man, come evil thoughts, sexual immorality, theft, murder, adultery, coveting, wickedness, deceit, sensuality, envy, slander, pride, foolishness. All these evil things come from within, and they defile a person.” (Mark 7:21-23) Pride is indeed a sin and as the passage says, it “defiles a person.” Pride makes you unclean and impure. The sin of pride must be handled consciously. If you don’t take it seriously, you won’t even recognize your prideful attitude. It will infect many of the decisions you make. What Does God Think About Pride? “Pride and arrogance and the way of evil and perverted speech I hate.” (Proverbs 8:13b) “Everyone who is arrogant in heart is an abomination to the Lord. Be assured, he will not go unpunished.” (Proverbs 16:5) These verses really gripped me. God hates it when we are proud. Why does God hate pride? God hates it because it comes from inside of the heart. A proud man thinks of himself as higher than someone else. Are you too busy to hold the door for someone? Is your circle of friends too classy to go and help feed the homeless? Is your car too clean to give someone a ride somewhere? Do you avoid people that you don’t want to associate with? Believers in Christ are called to be servants (Mark 9:35) and if our lifestyle prevents us from serving in any capacity then repentance must be made with God. You may have to give up some things in order to really fight the temptation of pride. Pride is a device that can be so easily woven into anyone’s life. The Old Testament is filled with two-fold stories, where a present story is told, while a different story is also portrayed (usually in the form of prophesy). Ezekiel 28:11-19 is one of those passages. It is being written presently to the King of Tyre, but it is also prophetic about Satan’s end because of his pride while he dwelt in heaven as an angel of God. “You were an anointed guardian cherubim.” (vs. 14a) “You were blameless in your ways from the day you were created, till unrighteousness was found in you.” (vs. 15) “Your heart was PROUD because of your beauty; you corrupted your wisdom for the sake of splendor. I cast you to the ground.” (vs. 17a) That verse also refers to Genesis where Satan was literally cast to the ground, “on your belly you shall go, and dust you shall eat all the days of your life.” (Gen 3:14b) “By the multitude of your iniquities, in the unrighteousness of your trade you profaned your sanctuaries.” (vs. 18a) “All who know you among the peoples (God’s children) are appalled at you; you have come to a dreadful end and shall be no more forever.” (vs. 19) It is because of Satan’s pride that sin started. Satan wanted to be God. God cannot be in the presence of sin, which is why He cast Satan into his own realm where he could be king, in hell. Satan is coming to a dreadful end, indeed, because his fate in the lake of fire is approaching quickly. 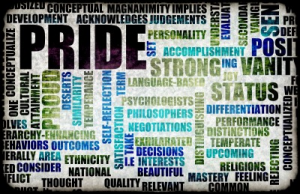 Pride is a device that can be so easily woven into anyone’s life. It is an abomination to God and it must be kept in check. We all fall prey to it and we need to repent when we do fall. God bless you as you live out a life worthy of the calling. Superbly done again Derek. Truly, I must take this article to heart for God can not use me if I am full of myself (which happens all too often). I love John the Baptist’s saying that “He must increase, I must decrease.” Let that be my personal mission statement brother. Well done. Thank you Jack. This was a very humbling article for me to write. I know that I must keep myself in check, so that God can use me to His fullest capacity. I love your quote from John the Baptist. It is so true. God bless you brother. This is a really good article! The bible really has a verse for everything that a person may need in life. I especially like Psalms 10:3-4 verse, because it describes me at one point in my life. As I read the WCWTK site articles and the Bible, I learn so much. Thank you all for writing! Derek: Your article is quite good! I had to sit back and really do some thinking. When you said, “Do you open the door for other’s?” Wow, I thought I hardly ever do that. That really got to my heart. Sometimes it is so hard to recognize pride. Thanks for your thought provoking article that got deeply to my heart. I want to serve Jesus with all my heart, and sometimes we just need someone to give us that extra special word to further the Kingdom of God! May the Lord richly bless you. WOW ! what a beautiful article i enjoyed reading it . Reading this helps so much in the study im doing . what a great job you did . it is so humbling reading and realizing that pride is such a real thing that satan has put here to temp us with. great job, God really has a true deciple doing great work for Him. What do you mean, you need some milk? Do you mean simple Bible teachng? Is so, please call your pastor and join a Sunday school and Weds night Bible study. What do you mean, “Gimmie some milk?” Please explain what you mean?